Snugglebug University: A Super Easy Doll "Quilt"
A Super Easy Doll "Quilt"
Those of you that have followed my blog for a while know that when I put out a new pattern I like to post a small part of that pattern on my blog here so that you can see a little bit of what the pattern is like. 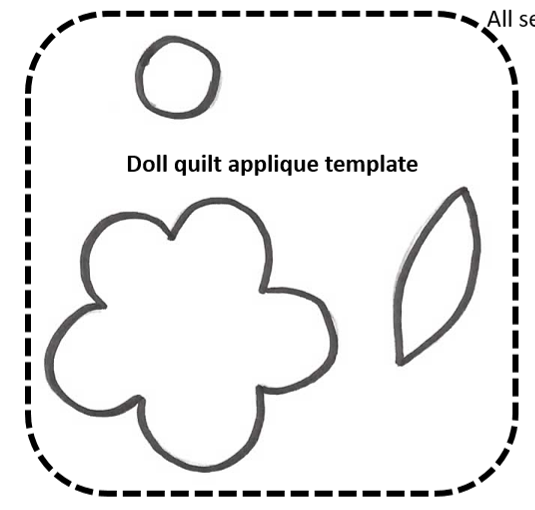 Last week I released my Baby Bug Doll Pattern...so today I'm going to share with you how I made that cute little flower "quilt"! If you're looking for something simple...this one is just for you! It's more like a cheater quilt, but I love it all the same! It's a great scrap saving project--made with just some basic applique--and I think the hand stitching makes it so much fun. I picked some fabrics that coordinated with the convertible bed/purse that I made for Ellie's baby doll. 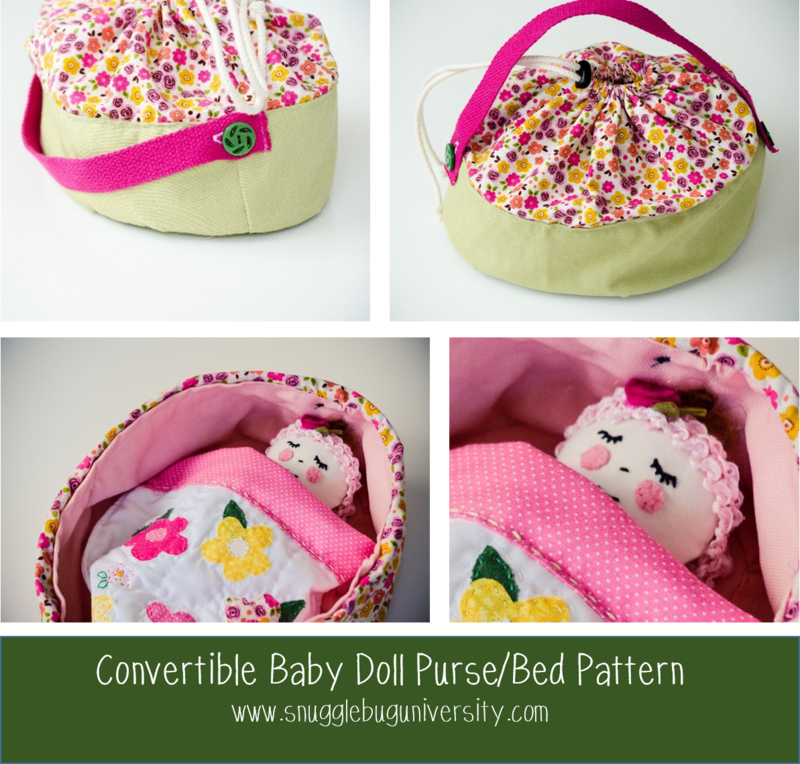 (The purse/bed and doll are a part of the Baby Bug Doll Pattern.) Today though we're going to talk about that little quilt! Are you ready to get started! Let's go! *Light weight quilting cotton works great for this project. Step 1: Begin by cutting two 10 x 10.5 inch pieces from white fabric. If you’d like to add a upper strip of color to the top, cut out a 2 x 10 inch strip of contrasting fabric. Position on the front fabric piece. Sew the strip piece to the front. Flip the strip up and topstitch near the fold. Use the template to cut out the desired number of flowers that you’d like to add to your quilt front (I used 5 placed randomly on the quilt). Cut out the same number of flowers and flower centers out of fusible interfacing. Let’s talk about how fusible interfacing works. Fusible interfacing has a bumpy side and a paper backed side. You’re going to want to put the bumpy side onto the wrong (back) side of the fabric, then iron according to manufacturer's directions (hot dry iron). After the fabric cools, remove the paper backing. 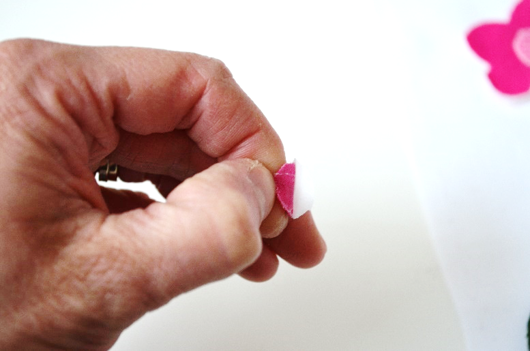 The adhesive will remain on your fabric and look a little shiny. 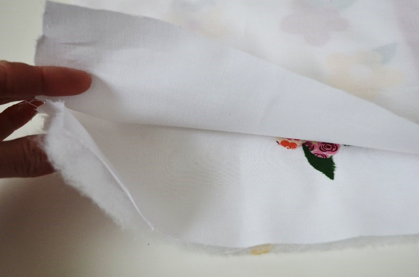 If the paper doesn’t peel off easily, you probably haven’t ironed enough, so just try ironing longer. Then iron to your base fabric. 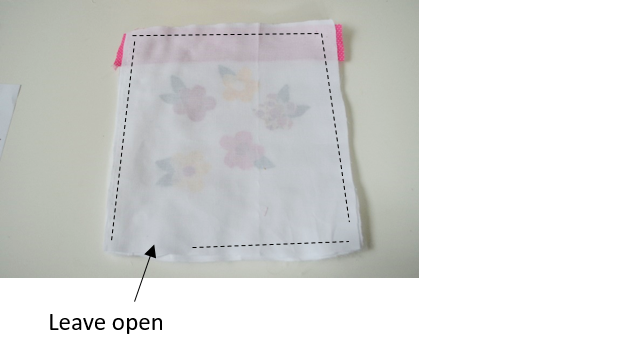 Attach the flower centers to the flowers with fusible interfacing. 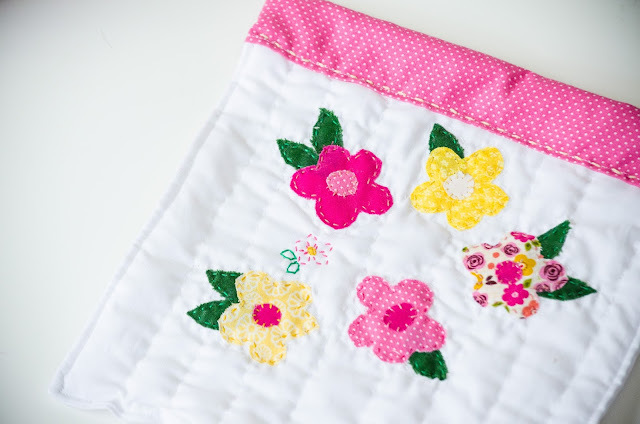 Then fuse the flowers to the front of the quilt. Once you’ve attached your flowers, make a sandwich of your fabric and batting. The right sides of the quilt should face each other, while the batting should be on the bottom. 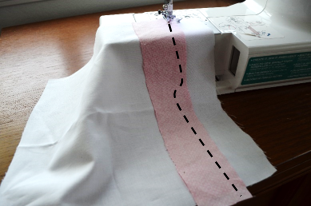 Sew all around your layers, leaving a few inches at the bottom open for turning. Turn right side out. Fold in the edges from the open part of the quilt. Top stitch around the quilt edges to close the opening and make the edges looked more finished. Finish your quilt by hand (or machine) quilting the rest of the quilt. I sewed vertical lines, and used embroidery floss to sew around each of the edges of the flowers. All done! 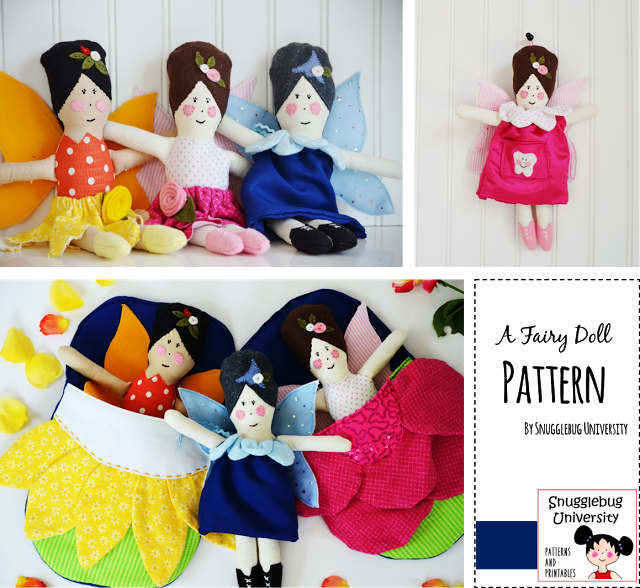 If you like this post, you might like this one as well: The Fairy doll pattern. I shared this baby quilt on Show off Saturday! Click on over to see the other great projects! Ah, thanks Sheila! Glad you like it! Oh I need to make this for my little girl! haha! 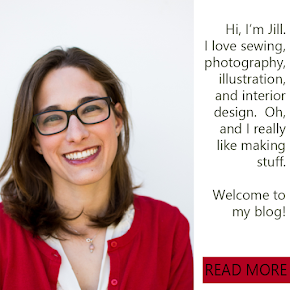 I love sewing for my kids too! So much fun. Happy sewing! Hi Debbie, I'm sorry that Caroline's post mislead you. I entered the quilt in show off Saturday--not the pattern. I just looked back at Caroline's post and I didn't realize that Caroline's title mentioned the baskets--her text is about the quilt though. It was probably just a typo. Anyway, I'm sorry that you felt deceived. There is however plenty of free patterns and tutorials on my site...I hope you can find something you like!